Syringoma is harmless sweat duct benign growth, typically found clustered on eyelids, although they may also be found in the armpits, umbilicus (belly button), and other parts of the body. When these benign lesions are not located in on the periorbital region they are referred to as Eruptive Siringomas. The name syringoma is derived from the Greek word syrinx, which means pipe or tube. The name suggests the exact problem of the condition which is a benign overgrowing of the sweat tubes cells on the epidermal part of the skin. It is important to emphasize that Syringomas are benign lesions and to not pose any threat to health. Therefore they can be left untreated and they are only removed for cosmetic reasons. Normally people seek to have only periorbital Syringomas removed because they are the most visible and the most difficult to conceal with makeup. 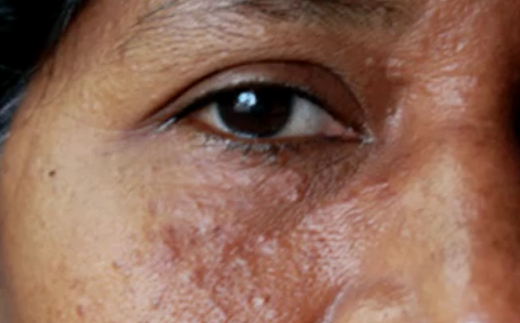 The picture left side is used to illustrate in which layer of the skin Syringoma are developed. As mentioned above, Syringomas are found on the epidermis and are small benign growths of the final part of the sweat duct tubes on the epidermis. Syringomas come in many different shapes and colors, they can be oval, dome-shaped or round. Their size can vary from syringoma to syringoma. Periorbital Syringomas can be both clustered unevenly in one region only or quite well distributed throughout the area of the skin around the eyes or the eyelids. 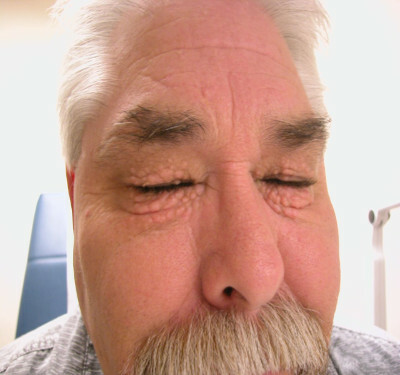 The word Syringoma is normally associated with the small plaques around the eyes. 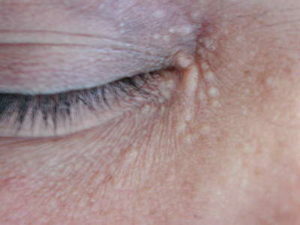 However, it has to be remembered that the often appear on any other part of the body (Eruptive Syringomas). The reason for the association of Syringoma to a periorbital skin condition (which means a condition developed “around the eyes”) is due to the fact that people seek help to have them removed especially when they develop around the eyes. Periorbital Syringoma are skin-colored or yellowish firm rounded bumps, 1-3 mm in diameter, and they are often confused with xanthelasma, because of their color as well as their presence around the eyes. Syringoma can appear at any age, though they usually occur after puberty. Syringoma can develop in people of any race and gender, females seem to be more affected than males. This may not be due to the condition actually affecting more women than men, rather because women are generally more self-conscious than men and seek help more often. Syringomas can occur at any age, though they usually occur after puberty. Syringomas can develop in people of any race and of either gender, though females are more commonly affected. In the bottom picture, you can see the classic periorbital Syringoma. In this case, these lesions are easily recognized as Syringoma given their skin like the color and their clustered formation. Syringoma are believed to be of familial origin. Around 18% of people with Down syndrome have syringoma. People with diabetes are more likely to have a syringoma type known as clear cell syringomas. Eruptive syringomas appear abruptly in adult life, as a crop of multiple lesions typically on the chest or lower abdomen. Most people with eruptive syringoma are Asian or dark skinned. The skin biopsy appearance under a microscope is characteristic. There are small ducts with comma-like tails, looking like tadpoles in the skin. Most cases are diagnosed by their appearance. A biopsy may be needed to exclude other similar kinds of tumours such as trichoepitheliomas, trichodiscomas, fibrofolliculomas as well as milia and basal cell cancers. Biopsies of syringomas show comma-shaped sweat ducts in the dermal (deep) layers of the skin. Syringomas are benign so they do not require treatment. However, they may be treated if they are disfiguring. The aim of treatment is to reduce the visibility of the tumour rather than eliminate it completely. This reduces the risk of scarring. In order to achieve this, the upper portion of the syringoma is treated reducing its size. If complete ablation or tissue removal is carried out too deeply, scarring may result. More recently fractional ablative lasers have been introduced allowing treatment of the deeper component of the syringoma with the much-reduced risk of scarring. People with darker skin types are at greater risk of scarring. It is wise to treat a small test area first. If this is successful, without complications or unacceptable scarring, then a larger area can be treated. Syringomas can recur after all forms of treatment as they penetrate into the deep dermis or deeper layers of the skin.